Hybrid cat breeds are the offspring of two animals of different breeds and species. Breeds of cats (domestic cats) all originated from the same species of domesticated wild cat. In December 2009 over 36 species of wild cat were classified, but this figure is in constant debate between scientists. There is of course a difference between man-made hybrids and natural hybrids. Man-made hybrids are not a new trend - at the Crystal Palace show in 1875 the "Wild or Hybrid between Wild and Domestic Cats" category was won by an Ocelot. Natural hybrids occur when domestic cats or feral cats mate with wild cats. These matings are usually voluntary and there is no human interference as with the man-made variety. These hybrid cat breeds occur when a domestic cat mates with a wild cat. The Bengal cat breed is a cross between a domestic cat and a Leopard cat. The Bristol is a cross between a domestic cat and a Margay. 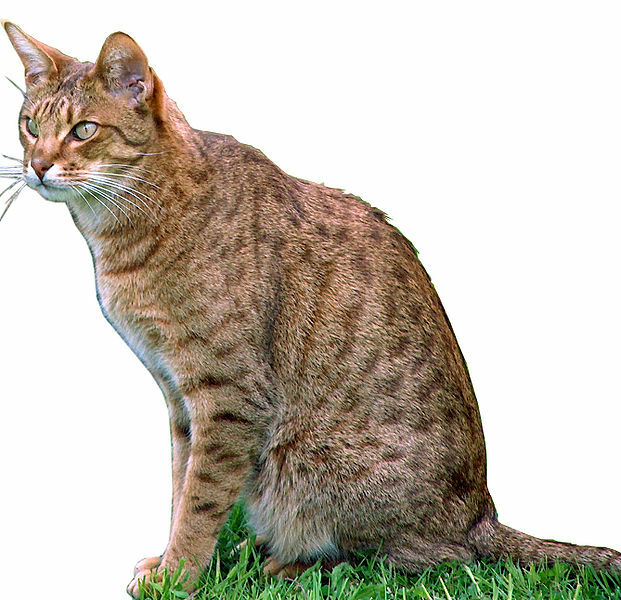 The Chausie cat breed is a cross between a domestic cat and a Jungle cat. The Jambi is a cross between a domestic cat and an Asian Fishing cat. The Machbagral is a cross between a domestic cat and a Fishing cat. The Punjabi is a cross between either a domestic or a feral cat and an Indian Wild cat. The Safari is a cross between a domestic cat and Geoffroy's cat. The Savannah is a cross between a domestic cat and a Serval. 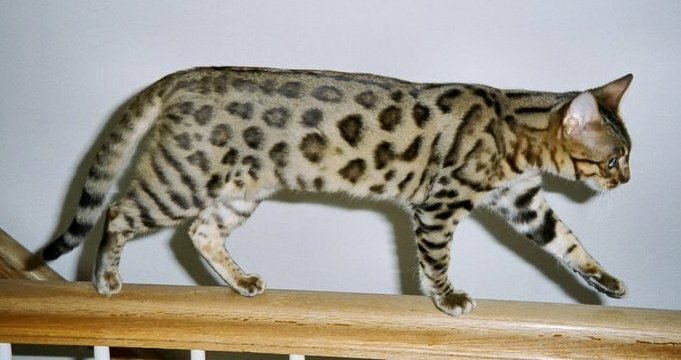 The Ussuri is a cross between a domestic cat and the Leopard cat. These hybrid cat breeds occur when a cat of a specific breed mates with another cat of a completely different breed. Sometimes three domestic cats can be involved in the hybrid. The Alaskan Snow Cat is a cross between a Silver Persian and a Somali. The Arctic Curl cat is a cross between the Turkish Angora and the Selkirk Rex. The Australian Mist is a cross between the Abyssinian cat, the Burmese and a domestic shorthair. The Bambino is a cross between the Munchkin cat and the Sphynx cat. The Bombay is a cross between a black American Shorthair cat and a Sable Burmese. The Bramble cat is a cross between several breeds, two of which include the Peterbald and the Bengal. The Burmilla is a cross between the Burmese and the Chinchilla Persian cat. The California Spangled cat is a mix of various domestic cats such as the American Shorthair, the British Shorthair and the Abyssinian. 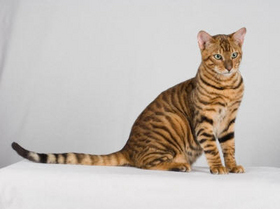 The Cheetoh is a cross between the Ocicat and the Bengal cat. The Dwelf cat is a cross between the Munchkin cat, the American Curl and the Sphynx. The Elf cat is a cross between the Sphynx and the American Curl. The Exotic Shorthair cat is a cross between the Persian and the American Shorthair. The Foldex is a cross between the Exotic Shorthair and the Scottish Fold. The Himalayan cat is a cross between the Persian and the Siamese cat. The Kinkalow is a cross between the Munchkin and the American Curl. The Napoleon is a cross between Exotic Shorthair cats, Persians and Munchkin cats. The Poodle cat is a cross between the Scottish Fold, the Devon Rex and the European Shorthair cat. The Ragdoll is cross between a Birman and a Persian cat. The Skookum is a cross between the LaPerm cat breed and the Munchkin. The Snowshoe is a cross between the Siamese and the American Bicolor cat. There is uncertainty about this hybrid cat breed. It was either discovered in 1967 and then a breeding was established or the Tiffany cat breed was the result of a cross between an Abyssinian cat and Foreign Longhair cat. The Tonkinese is a cross between the Burmese and the traditional Siamese cat. The Toyger is a cross between a Bengal and a domestic tabby cat. These hybrid cat breeds are the result of two entirely different wild cat species mating. These hybrids are almost always the result of human interference. This is a cross between a bobcat and a species of Lynx. The Jungle Lynx is a cross between a bobcat and a jungle cat. The Marlot is a cross between a female ocelot and a male margay. The Liger is a cross between a male lion and a tiger. The Leopon is a cross between a female lion and a male leopard. The Tigron is a cross between a female lion and a tiger.